This promotions is for 50% off tickets to Hitzville! Just book here and no promotion code will be needed. 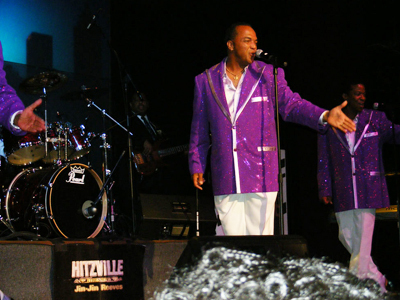 Hitzville the Motown revue, takes place in the VTheater inside of the Planet Hollywood, Miracle Mile Shops. 50% Off available online only. 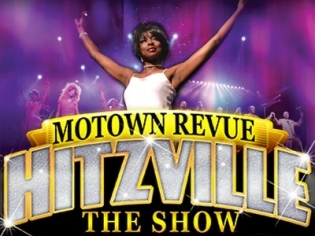 Hitzville Motown is a wonderful show that brings audiences all the classic hits of artists such as The Temptations, Gladys Knight and the Pips, The Four Tops and Diana Ross & the Supremes. The Show features a full band, a fantastic female trio, a quartet of scorching men and Hitzville Motown’s very own “dreamgirl,” Ms. Jin Jin Reeves. 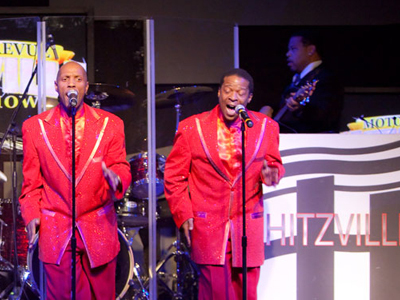 Hitzville Motown is a show that takes audiences on a journey back to the golden era of Motown and performs the classic hits of artists of that period including The Four Tops, Diana Ross and the Supremes and The Temptations. 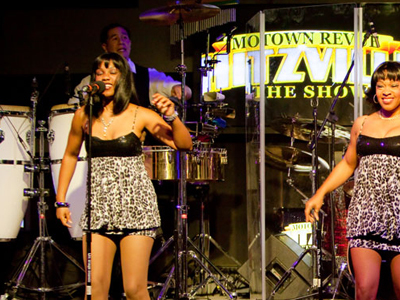 The show features multi-talented performer and Hitzville Motown’s own self-proclaimed “dreamgirl,” Ms. Jin Jin Reeves. Ms. Reeves started her career in Detroit, MI at an early age. She was very much into dancing, singing and songwriting and her talents were instantly recognized by some of the most influential artists of the period. She has since been a contestant on Star Search and even appeared in the Steven Speilberg movie Amistad, in addition to recording her own studio album. 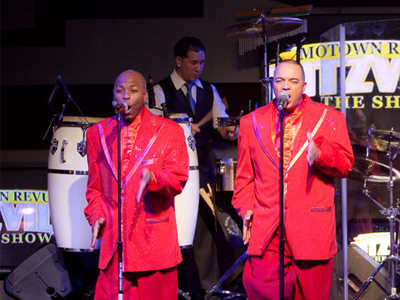 When all of the elements of Hitzville Motown come together, it results in a fantastic evening of musical performances that will have you dancing in your seat. 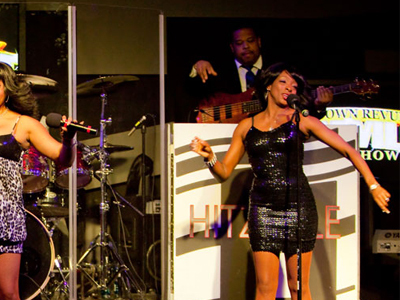 In addition to Ms. Reeves, Hitzville Motown incorporates the talents of a trio of female singers, four amazing men and a full accompanying band. This show is a celebration of an iconic era in music history that provides endless moments of nostalgia sure to have you in awe. This show was enjoyable. They were all wonderful singers. A lot of the music was old Motown. The songs that were performed made me think of old times. The tickets were reasonably priced. I recommend seeing this. This is really like going in a time machine to back in the day. I loved these old motown performances. I didn’t want the show to end, that’s for sure. I loved the show, it’s a must see!! Good show, horrible customer service! !! The show was good but the customer service after the show as you are walking out? They are selling cds and dvds, that’s horrible! You spend your money to see a good show and they lack the humility to provide excellent customer service. Come on. I paid for my ticket now I have to buy a cd or DVD? and if I don’t your rude? Not good business at all! Buyer be warned! We went in November 2014. I absolutely loved this show. Very good atmosphere, performance from all was outstanding. Everyone clapping and singing along. If you want to go back to a time when The Temptations, Gladys Knight, and Tina Turner performed this is a great show to witness! The fact that we had to be there an hour early seemed a bit ridiculous to me though. However the performance was fast paced and authentic! A nice change of pace to most shows in Vegas. This show was great! The singing was alot of old Motown. Everyone was singing and clapping along to the music. The performers had wonderful voices. The dancing was well choreographed. Our favorite singer of the night was JinJin. The show was not sold out the night we went, but it still was a great evening. It brought back some great memories with each song that was performed.